As we inched closer to the premiere date of Star Trek Beyond, I started time traveling. One minute it’s June of 2016, and I’m counting the days until I see the new movie. I’m hoping it’ll be great, worrying that it won’t. The next minute, it’s 1979. I’m thirteen, and I’m standing in line outside a movie theater that hasn’t opened for the day yet, waiting to see the first show of Star Trek: The Motion Picture. I’m full of excitement, and some of the same combination of hope and fear that I’ll have again in 2016. I was born the same year Star Trek was, so by the time I was old enough to watch it, it was already over. I saw it all in syndication, multiple times a day (back before DVRs and streaming TV), but everyone on it had moved on and nobody talked about it anymore. The Animated Series was barely a blip on my radar; I don’t think it even aired where I lived. (One of you readers will know; you always know.) But I was obsessed, which made me a lonely nerd. You want to try being an adolescent girl who was into Star Trek in 1976? I didn’t think so. For those of you who grew up with Star Trek: The Next Generation, or in that golden era when there was a movie and two TV series in production at the same time, it’s hard to imagine. But there was a long time when I thought it had all passed me by, the way the Beatles did. I bought the books and the Inside Star Trek album, I ordered Posterbooks from catalogs, but merch was scarce. The most active world was the fan fiction one; long before the internet, you’d have to track these things down and then mail them money orders (if you were in Canada, which I was), and they’d arrive, months later, made mostly of construction paper and staples, but giving me a window into the world of fandom I wasn’t sure really existed until I held it in my hands. 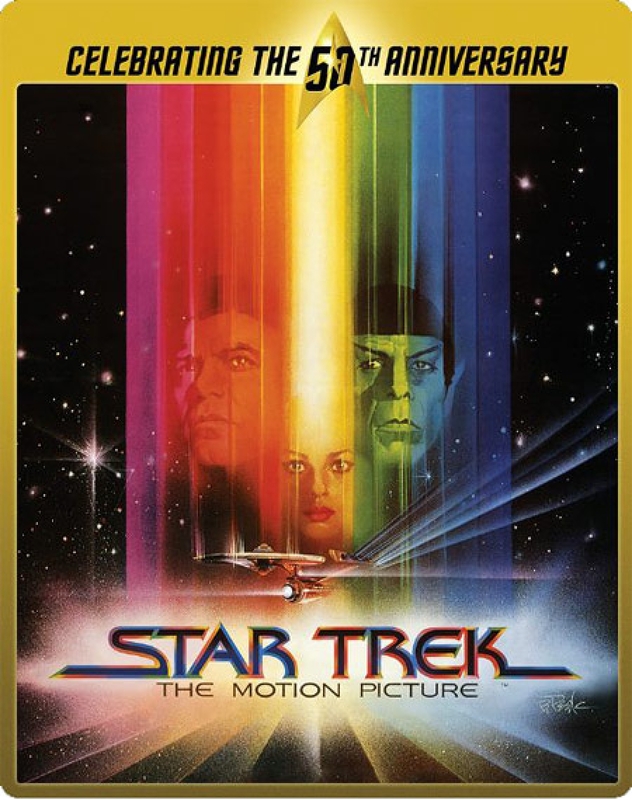 And then one day, on the back of a comic book, I saw it: an ad for Star Trek: The Motion Picture. It may have been a full year before the movie came out, or at least it felt that way, but I knew it was coming, and so I waited. And waited. It wasn’t like now, when I can scour the web and Twitter for updates, getting snippets of footage, watch a trailer over and over, and feel the world of fandom all a-quiver in anticipation. It was just me, and a picture on the back of a comic book, stuck to the wall of my bedroom with Sticky Tack. On December 7, 1979, with my mother’s permission, her cousin and husband took me away from school for the day. We got to the theater hours before they opened. We were not the only ones there, a revelation to me. I remember looking up at the marquee, still the kind where someone had to climb up on a ladder and put the letters up one by one. WILLIAM SHATNER. LEONARD NIMOY. No way, I thought. But there they were. These days, when you watch that movie, it seems pretty bloated. The pace is slow, the story takes forever to unfold, and they milked those expensive, beautiful visuals for all they were worth. They circled around and around the Enterprise until we were almost dizzy. I drank in every slow, sweet moment. I’d read about Persis Khambatta shaving her head, I knew who Will Decker’s father was, and I laughed at every word out of McCoy’s mouth. I didn’t know that Ilia and Decker were giving us the origins of the Troi-Riker romance, but I got all the subtext; who better to understand doomed romance than a 13 year-old girl? The pace was perfect for a fan like me. We clapped at the jokes, cheered at the arrival of each character, whispered about Kirk’s new seat belt, and recoiled in horror at the transporter accident, then secretly celebrated because it meant one thing: Spock was coming. Slow? It wasn’t slow at all. It was a gift to be savored. I don’t get that same sense of excitement about movies like I did that day, but I’ve gone to see every single Star Trek movie on opening day ever since. We closed on our house the day Nemesis came out, and after we signed the papers and looked at each other in astonishment, wondering why we still didn’t feel like grown-ups, my husband and I went to see the movie, then moved the next day. I’ve skipped work (and taken co-workers with me), I’ve rearranged plans, I’ve gone to events. Each one is exciting, but that feeling I had before that first movie remains unmatched. But that doesn’t mean I can’t be that kid again. I was at the Star Trek Beyond premiere at Comic Con in San Diego. The movie played on an outdoor IMAX screen, accompanied by a live orchestra. The cast and crew came out to introduce the movie, and when they were done, the orchestra started to play and we were treated to a spectacular light show and fireworks. My heart swelled and rose out of my chest, and the movie started, and I thought, just like I did in 1979: here it comes. Just before the end of the movie, I looked up. We were at the marina, outdoors, and I realized that we were really watching Star Trek under the stars. I was sitting next to an astronomy expert, and he saw me looking up at the night sky. “That red one is Mars,” he told me. Ever that sensitive 13 year-old, I wondered if he was kidding me, but he was sincere. This was it. This was everything. I was watching Star Trek under the stars, under the planets I’d never known I could see before. I’d flown to San Diego for this one night event, was leaving the next day, and every dollar I spent and every moment of my planning and travel was worth it. I suddenly saw the possibilities of my own life, of the fact that it doesn’t matter how old I am or where I am, there is always the possibility of more. So I’m doing a lot of time jumping these days. I’m a kid, alone, loving a show that nobody cares about anymore. I’m with a group of friends, in the ’80s, watching the first episode of TNG and being won over to Picard by the end of the two-hour premiere. I’m in my 20s, meeting James Doohan at a video store in New York. I’m helping Chris Kreski with William Shatner’s books. In 2016, I’m watching a new movie with 5000 other fans. Canada, my homeland, has Star Trek stamps and coins. There’s a new series in production, shooting in my hometown. Who would’ve thought? So maybe I’m 50 years old now, and introducing my kids to the franchise, but at the same time, I’m that 13 year-old kid again, looking up at that marquee in wonder. Come on, you gotta have a sense of humor about Trek after 50 years! As of this writing, they’ve also done TWOK & TSFS. Okay, I didn’t want to laugh but couldn’t help myself after a while. Haha. I had that same comic book back page taped to my bedroom wall. When the movie came out, I was grounded for something I don’t even remember now. I wasn’t allowed to go to the movie, but I was allowed to go swimming at my school’s indoor pool. I left the house with a gym bag with my bathing suit and towel. A block away I switched direction towards the local theater. After the movie I went into the restroom and made my hair and bathing suit wet as if I’d been swimming. Two weeks later, when my older sister took me to see the movie, I had to pretend I hadn’t seen it. TMP made me a Trekkie. Mind you I saw it in 1986 for the first time on VHS. It was a few months before TVH came out (the only reason I actually remember when I saw it). I had seen TWOK and TSFS but it was TMP that captured my imagination. I know a lot of Trekkies find that hard to believe but it’s true. I then rewatched II and III and saw them in a much different light. I remember after that going to the video store to rent out the original series episodes on video. Then the novels, which I read to this day, buying each as they come out each month. TMP has been and will always be my favorite Star Trek film. Great article, and it brought back a lot of memories for me. I just turned 51 a couple of weeks ago. Like you I was a Star Trek fan at an early age (it was one of the first things my brother and I latched on to when our family came to America in 1970, I was 5 years old then). We would watch it religiously every night on Channel 56 in Boston and learned to speak English watching the reruns. We bought the photonovels, the James Blish adaptations, and every holiday or birthday meant another Star Trek toy: phaser flashlights, disc guns, AMT models, ad infinitum. We bought the shows on VHS, DVD and BluRay. I’m sure we’ll buy them again down the road. We watched the animated show when it premiered on Channel 4 on Saturday mornings and were mystified when it quickly disappeared a year and a half later. Luckily we have it on DVD. I remember reading Starlog every month, counting down the days until ST:TMP premiered, searching for every scrap of info I could find. We bought the Roddenberry novel and read it before the movie came out. We saw the movie and loved it (it was the first movie I ever saw in a movie theater; fitting). It’s still one of our favorites. Slow, maybe, but also majestic and mysterious and really in keeping with Roddenberry’s vision. We watched all the latter shows, bought the toys and other collectibles but they never captured our imagination like the original. They’ve fallen by the wayside for us over the years. These days it’s hard to get excited about a movie like it was back then. Part of that is age but it’s also the ease with which you can discover everything. A few quick internet searches and you know the plot weeks in advance. There was a time when the only source of info was magazines like Starlog, Cinefantastique, and so on; going to the bookstore (another endangered species) to see if the latest issue had arrived was a big event. After seeing the movie, you had to wait years to see it again on TV. These days the anticipation just isn’t like it used to be. We got to see ST: Beyond a few days ago. My brother was indifferent; for him it all begins and ends with that original cast. I was able to enjoy it for what it was: a modern take on the concept necessarily bent to the needs of a summer tentpole movie. I had fun, but it will never compare to the magic of a 14 year old seeing the Enterprise on the big screen for the first time back in December of 1979. Kind of Trek meets Vonnegut – sounds as though you’re timetripping like Billy Pilgrim. Dug it, thanks! Ah. The Human Adventure is just beginning. TMP was my FIRST movie I saw in the theater at 8 years old. Much like you had come to Trek by way of syndication and also the Mego action figure line. Still love it to this day, and I always watch it the first week of December every year. (more times during the year as well) Glad you had such a great time with the Beyond viewing, that sounds awesome. Wow amazing article. TWOK was my first Trek in a theater (actually a drive thru…I feel sooooo old lol). But yeah they are great memories to have especially when more keep coming for better or for worse. The closet I got to something like that was seeing the first reboot movie at the Sydney Opera House with the whole cast and crew. Yeah that was a great moment in my life and one I will remember forever. As for TMP honestly it was a complete bore of a film. I’ve seen it twice, i can’t even imagine trying to see it again. But the fact is it did kick off the Trek movie series and that success got us TNG and the rest is history. Anyway, its great to hear memories like this. I was born the same year TNG came out. 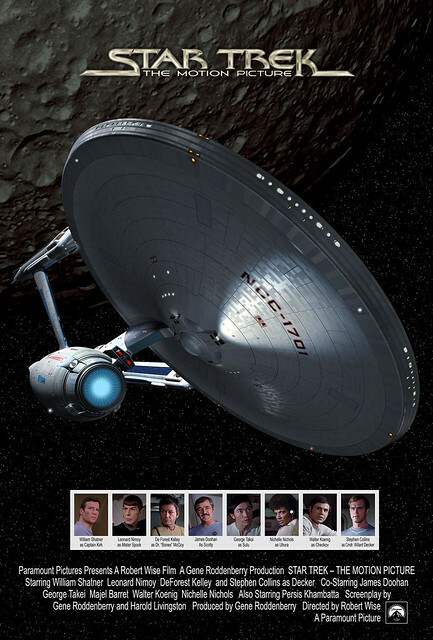 I grew up with the Enterprise D. Generations was my first trek movie. And I’ve been a Trekkie ever since. Ive seen all three of the new movies and Beyond is by far the best of the new. Love it love it love it. I thought TMP was slow even when it came out. Good but slow. I watched it recently for the first time in years, this time on Blu-ray on a 65″ plasma. Still good but slow. I saw it the first time on the night before it opened. A friend had a friend who managed a movie theater in Oakland CA, and they used to run through the movies the night before they opened (after all the other movies had finished) to make sure the prints were OK and whatever. So he could let a couple of friends come in and sit in the balcony (yes, movie theaters had balconies then) to watch it. For free! But later on I paid to see it a couple more times, then of course bought it on various analog and digital media, so Paramount didn’t really lose anything on me. Some people are so damned lucky !!! I’ve never been to comic con. Ever !!! It burns me up that these tickets are booked out way in advance. I live in nyc, and can’t even get to the one here. I’m either working or some other crap. One day, going to make it to one of them. And it pissed me off never, ever been to any Trek conventions. Damn shame. But, when you are on a budget, I guess you have to settle for the movie or the television series. Go figure. Unfortunately, it just turned out to be a re-issue of the plain ‘ol original cut again. But between the more polished visuals and the improved re-editing, I refuse to watch the rushed ‘Theatrical’ version ever again. So I’ll just stick to the DVD version in future, whatever. Those links don’t seem to be working, so that’s a pity. @ Disinvited – Thanks. Yes, it does indeed help if you type the links right. Which I didn’t it seems…in all 3 cases! oops. @ Disinvited – you say I didn’t use the http:// to embed my links…but I DID do that with the dvd cover in my 3rd link in one of my posts above…and it still didn’t show the picture unless you clicked on the link itself. So still not sure what you mean. Thanks for showing the images directly however. I’d love to see the Director’s cut on Blu Ray as well. I think there’s hope since they did release TWOK director’s cut on Blu Ray. There’s probably more work for TMP because the updated effects were done specifically for the DVD (where TWOK scenes were always there). But I think it will happen at some point. I’d rather have a really good scan and transfer of the theatrical version, or a branching version. I hate the so-called director’s cut, both for sound and image issues, and have never considered it all that legit, given that it doesn’t match with much of the changes Wise discussed at the time of the film’s release and shortly thereafter. Ideally an edit-your-own option would be best, since I could add the tear scene to the theatrical, then edit out the really bad stuff in all versions (like the horrible shot of the space guy at the end of epsilon9’s destruction.) It looks bad enough on a TV, in the theater it was excruciatingly awful. I remember that comic book ad – I spotted it myself in 1979 on the back of a Detective Comics that my grandparents bought me. I was 10 when ST:TMP premiered, I loved it then, and I still love it today. It captured the wonder and majesty of space like no other ST movie (or movie, period), since. TMP is one of those movies that you either “get” or you don’t. Its visually stunning and is unlike any other film in the franchise in look or scope. Its score is arguably the best of the film franchise as well. The Directors Edition is, IMHO what should have been released originally if Robert Wise had more time to prep it. My only nit pick with the (one that I’ve carried with me for now for nearly 37 years!) is that its so similar to the TOS episode The Changeling. Still, I prefer the ‘slowness’ of TMP over the frenetic ADD Abrams films. But its all good. My fondness for 1979 The Motion Picture grows with each viewing since the first time I saw it in 1984 – and I loved it even then. To see that big screen transition from the Tv series was truly awe-inspiring. We will never again get a STAR TREK movie like this, alas. But I echo Chris Pine’s recent comments where he said he’d love to do a Trek movie where it’s not about the action*, but about what it truly means to explore, and to seek out new life. *I am a HUGE fan btw, of BEYOND. No KTVU where I grew up … plus I was at school at 2 pm on weekdays! this film would have got a better reputation if paramount had recut the film after its premiere as mr wise intended. keep that version in circulation, until the director’s edition came out, was as stupid a decision as releasing ‘final frontier’ in that shoddy condition in ’89. What a lovely article. I just came across an old scrapbook I kept with every shred I could find on the relaunch of Trek, from movie, to series, back to movie, etc. And I remember the same excitement opening day. Then entering the theater, listening to the lovely overture being piped in as people took their seats. Classy! I had a brief “Oh no!” moment when the credits rolled — those awful, boring white letters on black that actually seemed shaky on screen! Had they not seen “Star Wars”? Or “Superman”? Where was our awesome new ship, streaking past our star’s names, suspended against the cosmos in glorious widescreen?? (I knew nothing then of still-wet prints being raced to theaters to make the premiere date. No time for fancy titles!) But I got over it as soon as the Klingons arrived, and then V’ger, and all of our heroes along the way. Magical. I loved the film then, and still do, in spite of its flaws. This is something the bashers of the current production company just refuse to understand. There isn’t TNG, or Bad Robot, Berman, or even Roddenberry Trek. There’s just Trek, in its entirety, and the wonder it inspired. Gazing up at the sky and wondering ‘some day’…. At any given moment, has Trek always been at its finest? Obviously not, but then, Trek has always been more then the sum of its parts. I’ve not seen STB yet, but if, as reported, this episode has recaptured some of that wonder, then the movie has already succeeded. Thank you for this! I had a very similar moment after the movie was over, looking up and pointing out to a friend that Mars was shining brightly in the sky (I didn’t pick up on Saturn though). The biggest mistakes made were not running with the original cast and crew after the success of Star Trek IV; using them to launch the next generation, etc. Meyer had it right with Saavick and David Marcus leading into a whole future; even after IV they could have thrown in some minor characters or another ship in that exciting era to later expand on. Instead they went TNG to erase the original series and made Star Trek V lackluster. I still remember being excited about the pilot and wondering where is the Enterprise-A; where is Captain Kirk? What happened to that whole set up with the Klingon ambassador; no Peace as long as Kirk lives? Now poor Hollywood has to come up with odd time travel arrangements to try to set up the exciting world of Star Trek II-IV but open ended. Great article. 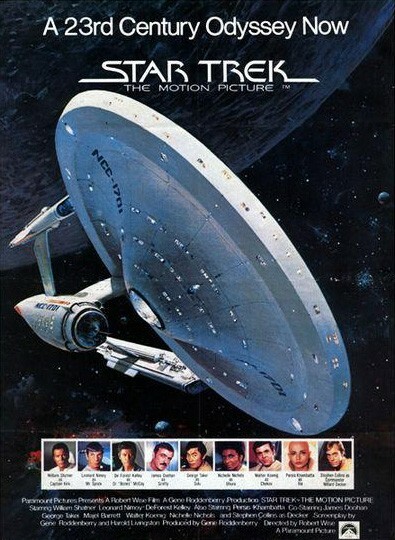 My 1st movie was Star Trek V, I was 14 & my brother took me. Ever since I’ve seen all the new releases (mostly alone because I hang with the wrong crowd who don’t like Trek) opening day. I usually skip work that day for multiple showings. I used to do midnight shows but am over that. Lovely read! Star Trek still inspires, but I don’t think the new movies inspire the way the originals seem to have done. To me, I’m still that nerdy kid who can’t talk about Star Trek to anyone because it’s that show that nobody cares about anymore. I’m 24 and everyone my age or younger think Trek is just a generic popcorn flick, it seems, if they even remember that much. There may be new fans coming into the fold, but in my experience it’s a trickle and not a stream. The first Trek movie I got to see in theaters was First Contact, and I remember being four and thinking the kiss between Data and the Borg Queen was so gross. But ever since I saw TSFS on VHS rental, my life became about Star Trek. I must have been three or so at the time, and I still remember it, the power it had over me, seeing these giant ships explode in space, these larger than life characters, this fantastic technology. TSFS is still I think my favorite Trek film. I really hope the next movie becomes the true hit Trek needs — a great, well-made film. TMP is the BEST of the ‘Trek franchise. My experience with TMP is similar in that the teaser poster you mention was the first print info I saw in a magazine. It was in school and it was in the back of Scholastic Magazine. If you look closer at the poster, the Enterprise was not the final one we would see in the movie. My first tv memory about TMP was watching Rona Barrett, the Entertainment Reporter on Good America, who reported on the visual effects problems the movie had in Jan ’79 or so. As far as the movie being slow, it didn’t feel that way for me. There was just too much to take in on one viewing. Whether its a character seen in the far right corner, or an interesting detail in the model work, which are many, there’s something new to discover about the movie on repeated viewings. I think I’ve seen the movie at least 18 or more times in a theater over the last 37 years since it came out. Also, the theater you saw it in had to be in the best possible venue, in stereo and on the biggest screen and with a full audience. If the sound was played too low, it just doesn’t have the impact that a movie should have. That pretty much goes for any movie. Presentation is very important. While the supporting cast don’t get much to do, Spock’s character has grown. The sickbay scene with Kirk and McCoy that has Spock come to terms with his human half, sets up the the events in II and III about self sacrifice and family. I think a lot of people overlook this character fact. Paramount should do an IMAX rerelease of this movie. Its the perfect one to do given the fact that its visuals were shot on 65mm. The first person aspect of its visual effects would be perfectly experienced in an IMAX or high definition format; the warp jumps, the opening Klingon ship flyover, Spock’s spacewalk. That was a wonderful reminisce, Lauren and it took me back to way back when..
I’m 57, we got Star Trek in 1969 here in the UK, so I was 10, awestruck. We were already into Lost in Space, Land of The Giants, Voyage to the Bottom of the Sea, and now this comes along. Whoosh goes the Enterprise across the star filled screen..
Splash go the bright gold yellow titles and I wanted to be Spock. No wait.. It was Kirk fighting the Gorn. Oh hang on.. I was gonna be McCoy pulling a medical rabbit out of the hat. Just a damn cotton pickin’ minute.. No, it was Scotty, the miracle worker. Hell yeah, I wanted to be all of them, Chekov with the cheeky youthfulness, Sulu with the bravado of a musketeer. There was nothing like it. western, romance, science, aliens, philosophical, morality, plain fun, escapism and the coolest gadgets. Man, the transporter. Coolest of the cool. Things stopped in our house for Star Trek. When we got a colour TV and saw those uniforms, the blinking lights on the bridge, the phaser beams, the bright beauty of a new planet (whatever sound stage background.. What colour planet this week guys?). Wow! Ant then some years later living on my own. Star Trek, the Motion Picture came along and I was back there again. “I should have know. . This.. simple .. pleasure” as Spock says.. The Human Adventure was worth seeing, worth sitting through. I’ve watched it, and every film since. Some could have been better, others could not have been bettered. Each film was made by (to quote Amanda Grayson:) “your flawed, feeling human friends”. Wow! You really took me back! I was 21 when it hit the theater, and when I showed up an hour or so before the first viewing, it had already been sold out. We had to wait for the second show and I was with a couple of friends that weren’t that into it to begin with, but I had dragged them along. I remember being elated and nervous at the same time. As much as I enjoyed the trip around the Enterprise (it finally seemed like a real ship! ), I was thinking, this is going much too slowly for my friends. I don’t remember what they thought of it, but I went back for 2 or 3 more viewings! Yeah, I was a big time Star Trek nerd. I had been a Trek fan since the early seventies. I somehow missed it when it was on NBC. Even though it seems I had been watching every other sci-fi releated show on tv, i.e. : Lost in Space, Land of the Giants, Time Tunnel, etc. anyway, once I discovered it in syndication, I was a fan for life. I would record the episodes on audio cassette so that I could listen to them again and again. In 1976 I wrote and directed a Star Trek documentary for my High School TV production class. It was narrated by a local TV weatherman, who happened to be the husband of one of my teachers. Around 1977, I made a Star Trek radio drama for a radio class I was taking in community college. I of course cast myself as Kirk. All those cassettes of episodes came in handy for music and sound effects! Anyway, I was obviously ready for The Motion Picture when it finally came out. And so glad that the franchise is continuing to Live Long and Prosper! Thanks for letting me share and so jealous of your Comic Con Experience! Thank you for a terrific, and heartfelt, story, and for helping refresh some memories for me too. I too remember the TMP premiere; my parents pretty much forced my big sister to take me to the movies to see it because they were working (a terrible fate for a non-sci-fi-fan popular girl to suffer through, apparently – okay, I admit it, driving my big sister nuts was a bonus for a bratty 9 year old little brother, too). I remember totally being in awe of the new Enterprise visuals, the cheering, the nightmare-inducing transporter accident, and all the other things that still make it one of my favorite Trek movies. And I’ve been to a bunch of other premieres since then, but none have come close to that because it was the first one for a guy born the same year as Trek but only able to see the reruns and TAS up to then – and TAS didn’t make nearly the impact TMP did, because even as a little kid I could see TAS just wasn’t the same thing, somehow. So you didn’t miss much of anything there.